The 24th NSO Workshop focused on solar active regions, their origin and evolution on the sun inferred from helioseismology, magnetometry and modeling. The combination of helioseismic, observational and theoretical efforts makes it possible, for example, to follow twist and helicity of magnetic fields/flux tubes from below the solar surface through the solar atmosphere into the interplanetary medium. Helicity-loaded fields are very probably responsible for the most geoeffective solar phenomena such as coronal mass ejections and flares. The main aim of this workshop was to bring together experts in magnetometry, activity, and helioseismology, to further our understanding of solar active regions and their creation and evolution. 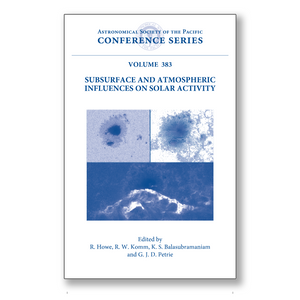 The 1 keynote, 12 invited and 27 contributed talks as well as 9 posters combined to provide an overview of the understanding of solar active regions. The key topics for this meeting were flows around active regions: surface and below, flux emergence and cancellation, space weather and active regions: back to front, morphology of active regions and filaments, magnetic flux and magneto-acoustic waves, and influences on coronal complexity. The NSO workshop series has a strong tradition of focusing on topics of current interest in solar physics. This book is suitable for researchers and graduate students.